Base of Operations: Mobile across U.S.
History: The children who would form Gen 13 were the results of years of genetic experimentation by the ruthless International Operations organisation, a rogue branch of the U.S. government. Unknown to them, their fathers had been members of Team 7, a group of covert agents for the U.S. government who had been mutated to give them superhuman abilities, which in turn they passed on as latent genes to their offspring. When they group were teenagers, they were recruited by I.O. to take part in it's Gen 13 project (the thirteenth generation of genetic tests); swiftly realising the plans for them were not benign, they banded together to escape, unaware that their latent abilities had already been activated by I.O. 's "Gen-Active" process. After they fled, they were branded a danger to national security and became fugitives, forcing them to stay together for mutual protection while they tried to uncover the truth about their pasts and find evidence to prove their innocence and bring down I.O. 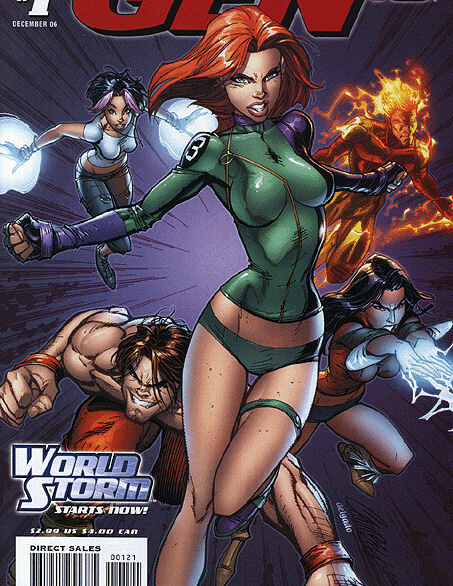 Nationality of creators: Jim Lee - born in Korea, U.S. citizen; Brandon Choi - unknown; J.Scott Campbell - U.S.A.
Country of original publication/appearance: U.S.A.
Other Media: Gen 13 cartoon made by Buena Vista studios (a subsidiary of Disney), not released outside of Australia and Brazil, perhaps because Wildstorm (who publish the comic) were bought by D.C., a division of Disney's rival Time Warner.